A light, nurturing cream to help brighten skin around the eye area. Enriched with organic Rosehip plus Vitamin C to help plump fine lines, lift and enrich delicate skin. Suitable for all skin types. This nurturing cream helps enliven the delicate eye zone and gently hydrate without causing irritation. 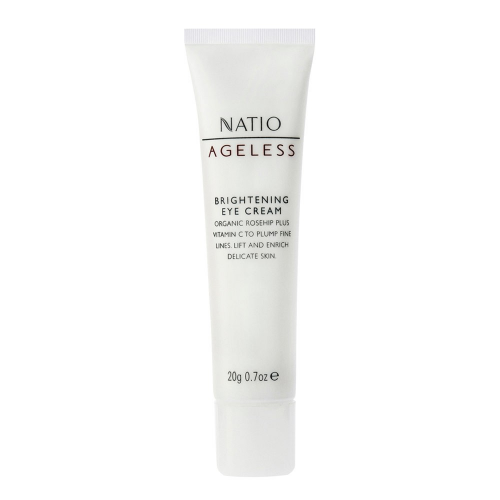 Encourage skin elasticity with organic Rosehip and Hazelnut to help firm and tighten. Aloe, Sweet Almond and Shea Butter to help nurture and hydrate skin around the eyes. Organic Rosehip to help moisturise and soften. Hazelnut to help tone, tighten and firm. Aloe, Sweet Almond and Shea Butter to help nurture and hydrate skin. Apply morning and night. Pat gently around the eye area.